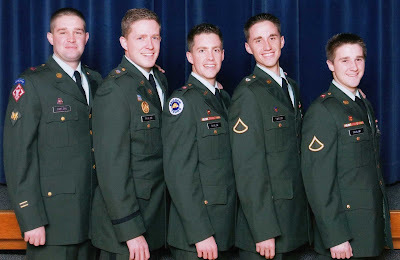 Our dear brother Brent (second in from the left) is finally coming home. Derek's brother has been in Iraq and Baghdad for the last two years....and his journey home has finally started. We are so excited for him and his family. We are even more excited that Jennie (his wife) no longer has to be a single mom with two crazy, but adorable kids. Oh the good times ahead of us all. Derek and I are thrilled that we will be joining everyone in Utah in a few weeks for Brent's homecoming party. I am so proud of all of our military, and their families. I have learned first hand how hard it can be when your husband is gone. Jennie once described it to me that "it is a little harder to breathe when they are gone.' It is true. My husband's family may be crazy, but they are a strength to my life, and my testimony everyday. We are soooo happy for you guys Brent and Jennie!!! We love you! How exciting! I cannot imagine my husband being gone for two years! I cannot believe all those boys in the Military! WOW! I hope you guys have fun! I am glad he is coming home! There is actually one more that has joined since the picture was taken. I'm so excited you guys are coming up for the party!!! We may be crazy, but at least we're all in this together :). Yeah Brent! Ok I am totally copying you with my post! Haha but we can all be excited together. I am just sad we won't be there for the party. Derek, I'm not sure if I should thank you for putting the two games on or not. I wasted untold minutes (if not hours) playing them. Very entertaining. I got 14 kills on the rage one. where are you at?